Whether you are a complete beginner, a novice rider looking to improve your ability or an experienced rider aspiring towads your BHS exams, we are the centre for you. We have a variety of horses and ponies to suit all riders and friendy, knowledgeable instructors to help imrpove your riding capability. 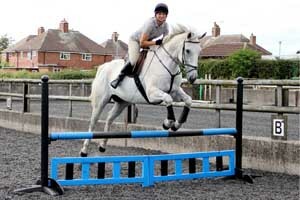 We are a BHS (British Horse Society) approved riding school. The BHS are committed to promoting through it's approval scheme, the highest standards of equine welfare, equestrianism and customer service at riding schools. Approved establishments such as ourselves must have horse and pony welfare along with client safety and satisfaction as priorities. We offer group lessons, all of which are standardised; the initial beginner classes are 30minute sessions, and aim to teach riders how to communicate the basic aids and how to walk, trot and canter on a safe, straightforward horse or pony. Children from the age of 4 can take part in our beginner classes. From here riders progress to our beginner hour class, whey they are required to ride more independently and begin to tackle small jumps. Following on from this we have intermediate and advanced classes, where more technical exercises, lateral work and jumping play more of a prominent role. 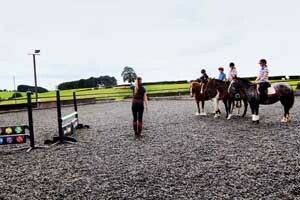 Aside from our group lessons we also offer both private lessons and shared lessons (small groups of 2, 3 or 4 riders), which can be either 30minute or 1hr sessions. Private lessons are beneficial for those wanting to take their riding a little more seriously as it offers one to one tuition. 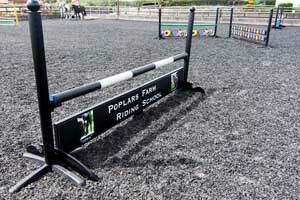 This enables riders to progress at a quicker rate, as it offers a more intense riding experience. Our shared lessons are popular with people who want to ride on a semi-private basis and share a lesson with friends/relatives etc, while still wanting a little more concentrated instruction than is available in group lessons. 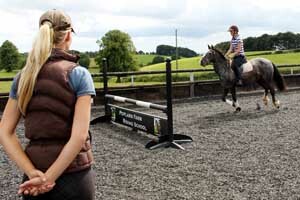 In addition to our lessons we also offer hacking, which allows people to have a change of scenery from the arena. Hacks run for an hour or 2hours and include a combination of roadwork and bridle paths. Hacks run weekly on a Tuesday morning, and more frequently throughout the school holidays. 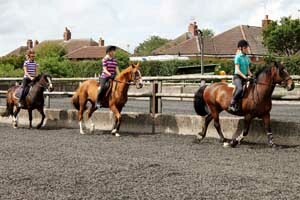 As well as our lessons and hacks, we also offer Children's Riding Days and Birthday Parties. 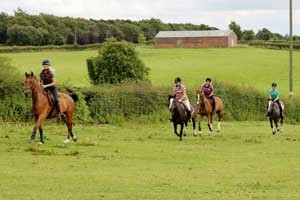 Riding days take place in the school holidays where children enjoy a day here from 9:00am - 3:30pm. They include an hour's riding lesson, children learn how to carry out various stable management activities and compete in a fun gymkhana where they will win a rosette to take home! Our birthday parties include an hour's riding experience for all riders, which usually involves a basic lesson followed by gymkhana games and a personalised rosette for all riders to take home. We require 5-10 riders for our birthday parties.